This small clock was designed for fashionable homes of the late 19th century. The relatively crude carving of the case may mean it was an inexpensive clock, even though the lettering on the dial suggests the maker, Howell James & Co., supplied clocks to Queen Victoria. Japan was closed to most outsiders from 1639 to the 1850s, when direct trading with Europe was resumed. Displays of Japanese objects at International Fairs in London in 1862 and Paris in 1867 caused great excitement, and by the 1880s all things Japanese were the height of fashion. This influence is apparent in the decoration of the clock, although in fact it bears little resemblance to authentic Japanese design. The clock's designer, Lewis F. Day (1845-1910), had a strong relationship with this Museum and the art school attached to it. He is best known for his ceramics and wallpapers, and for his writings on the philosophy of the Arts and Crafts Movement. 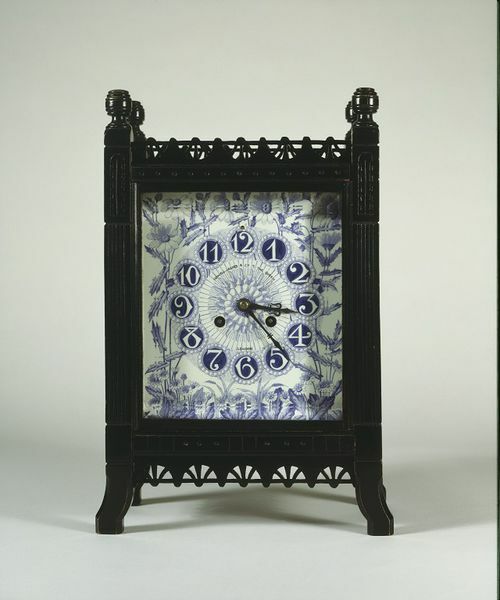 Sunflowers, shown on the porcelain dial of the clock, were popular in Aesthetic Movement decoration. Lampooning the style, Edward Linley-Sambourne depicted the poet, playwright and aesthete Oscar Wilde as a sunflower in a Punch magazine cartoon in 1881. "Day was a teacher and prolific designer within the South Kensington network, whose books frequently included Japanese examples. 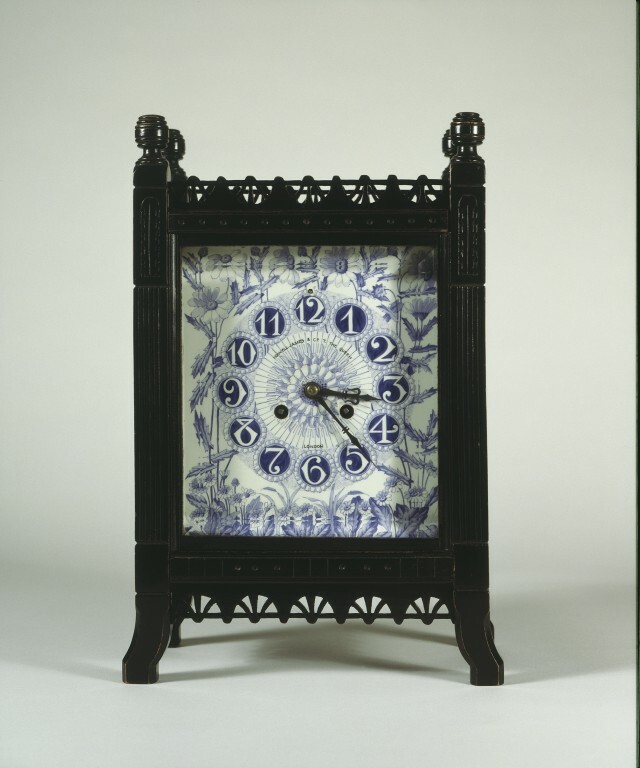 The ebonised case of this clock, with its fretwork decoration, and the flowers on its face have little to do with real Japanese decoration but would instantly have suggested the Japanese taste to Day’s contemporaries." Ornament Gallery text. Day was a teacher and prolific designer with the South Kensington network, whose books frequently included Japanese examples. 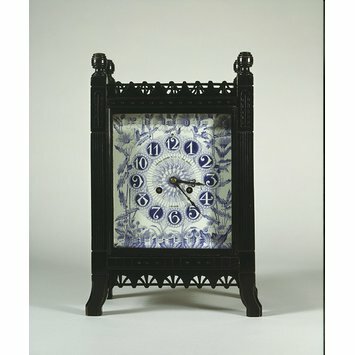 The ebonised case of this clock, and the flowers on its face have little to do with real Japanese decoration but would instantly have suggested the Japanese taste to Day's contemporaries.